Dr. H.J.M. 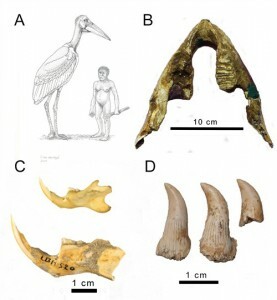 (Hanneke) Meijer has some interesting comparisons between the estimated size of the short-statured, long-armed, and large-footed cousin of ours Homo floresiensis and aviary fauna. That bird at 1.8m look like it could eat 1.0m. Never underestimate man’s capacity to kill– even if he is a Hobbit. These might have been the delicacy of Homo floresiensis or even their only food source. According to this research the island of Flores in Indonesia (despite popular misconceptions from documentaries movies by Peter Jackson, hobbits are not from New Zealand) was for a period an oasis just 4,000 years ago. There was fresh water and if there’s anything a vertebrae like us, Dodos, or Hobbits like is a good beverage. Could climate change and lack of good Dodo meat have killed our shorter cryptid cousins?